So, you’ve signed up for an account with an online casino, have taken advantage of the welcome bonus on offer, played a few games and racked up some winnings, but now what? How do you turn your winnings into cash in your hand? We explain all you need to know about withdrawing your bonuses and real money winnings from an online casino. 1. Sign into your online casino account. 2. Go to the casino’s banking or cashier section and select withdrawal. 3. Select your withdrawal method and the amount of money you wish to withdraw. 4. Follow the prompts to enter your payment information and complete your transaction. The most important thing to be aware of is that most withdrawals come with a processing time of at least a day or two, so you won’t necessarily get immediate access to your winnings. 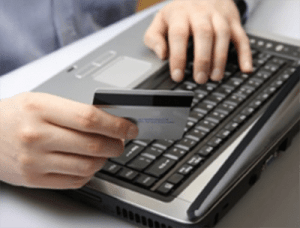 This is due to the casino verifying your account before processing your payment, along with any processing times required by your chosen payment provider. However, improvements to web wallet services like Neteller and Skrill mean some transactions can now be processed on the spot. It’s entirely dependent on the venue. Please be aware that you’re required to hit certain wagering requirements before you’re able to withdraw any money from an online casino. This means you’ll need to spend a certain amount of money at the casino before you’re able to benefit from the free credits you were offered. Some casinos also impose a cap on how much money you are able to win when playing with bonus money. Always check the terms and conditions of a bonus offer so you understand your requirements. For further information, read our detailed page regarding online casino bonus wagering requirements. The withdrawal options available vary from casino to casino, and may differ from the deposit options on offer. If there’s a certain banking option you’re hoping to use to cash-in your winnings, always check the terms and conditions of a casino before signing up to ensure that will be a valid option. 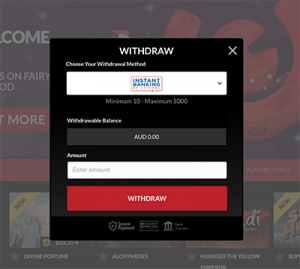 The withdrawal options available are subject to change at any time, so log in to your online casino account to see what options are available to Aussie players. You can also use the live chat function to speak to a customer service rep at a casino if you’re unsure about what withdrawal methods are available to you. Unless you have gained VIP status with an online casino, it’s important to note that each venue has its own limitations on how much or how little a player can withdraw at a time. This means regardless of how much money you have sitting in your account, you may not necessarily be able to withdraw it all in one hit. Guts – Minimum withdrawal of $10, and maximum of $5,000 when using Instant Banking by Citadel, minimum of $20 and maximum of $50,000 when using direct bank transfer. Royal Vegas Casino – Minimum withdrawal of $50, no maximum. One thing online players aren’t always aware of is that you will likely be required to provide proof of identification before being able to withdraw your winnings from the casino for the first time. While ID is not required to sign up for an online casino account, you may be required to provide a copy of your passport, driver’s license, utility bill or credit card when it comes time to cash in your winnings. If ID is requested, you’ll need to scan and email these documents to the casino operator. There are several reasons you need to provide identification, the most important being to prove that you’re over 18 (the legal age for gambling in Australia). Providing ID is also a way for the casino to ensure security measures are being upheld and that the casino isn’t being used for cash laundering or illegal activity in anyway. The ID you provide will need to match the details you’ve entered when signing up for a casino account, so make sure to use your correct name, date of birth and address when registering to avoid any potential problems when it comes time to cash your winnings. Looking for an online casino that offers a selection of trustworthy withdrawal methods? Sign up for an account at 32Red where Aussie players are eligible for a welcome bonus of $160.